You guys know I could never live for my own good only, You also know not always I have lived for my own good at all. You know my childhood was such a mess, you know there were people with drinking problem, very unhealthy family relations, bullying, no money, abusing, hiding, lying, anger.. There were no values, there were norms or understanding what was wrong and what was wrong. There were people who didn’t care and people who thought they can take and do what ever they want. Sometime people ask me how did I became the person like this, who loves so much and always help others? I can very simply tell you I had the worse examples to follow all my childhood until I moved to live on my own, and you know I did it at very young age. This is something that has always navigate and guide me in my life; thinking about “Am I A Good Example To Follow?”. This is what I want to be. But understanding to follow this kind of thought and norm at this young age is its own story, all I can very shortly say is “I had no parents to love me but I always had my God”. Next month it will 5 years since I adopted my Armani Bentley, my little puppy called BenBen. Last year has been hard to both of us: I lost my two other dogs and by that BenBen lost his brothers as well. This year I have seen and heard many dog parent have lost their babies as well: rest in peace all fur babies, your mommies and daddies and all siblings are missing you very much. And for all fur kid parents I want to say: “I can feel your pain like my own”. 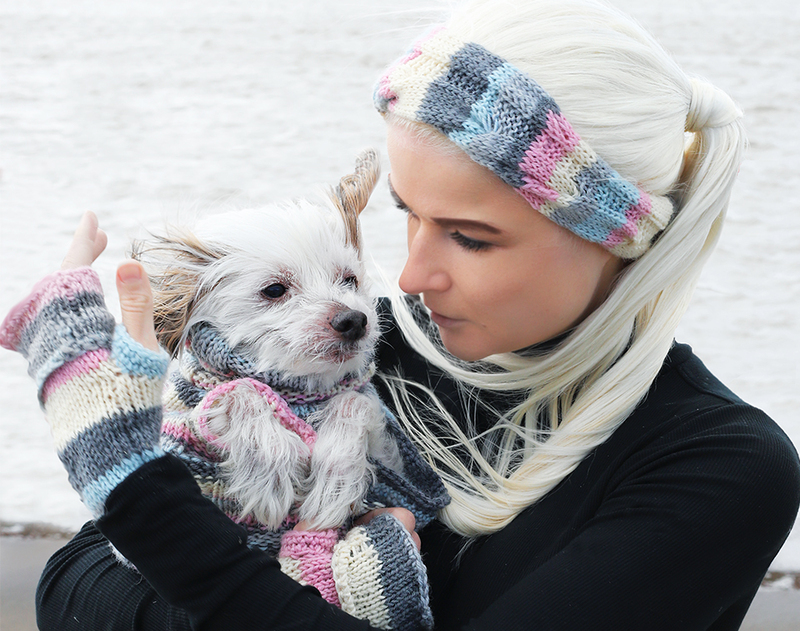 Many years I have donated special sweaters for dogs in need, for dogs who influence positivity with their parents and for many rescue dogs around the world. I design the clothes and manufacture each of them by hand myself. 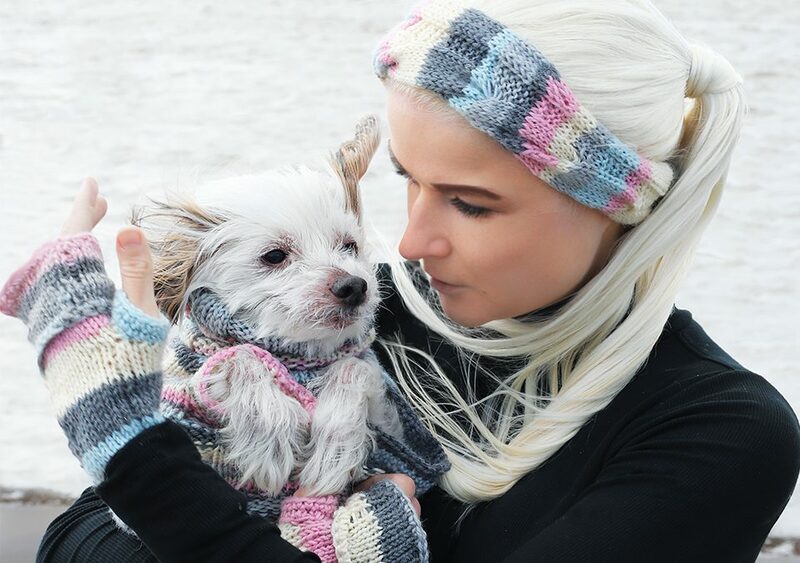 I started this charity work with my Chinese crested dog Oliver Bean in 2011 by founding our own company Bean&Pähkinä. I remember how did we go to the Trade register together for signing papers. Today we do everything like this online which is easier for sure but I am still very grateful for this lovely memory. Everyone who met Bean can tell he was more human than a dog. In 2013 Bean and I decided it was a time to adopt a brother to him. Already then we support adoption of human kids, human rights and children rights organizations so rescuing a dog was very important to us. Bean waited in Finland when I flew to USA to adopt Armani Bentley. After Bean passed away last summer, in August 2017, my dog clothes designing and manufacturing stopped for one year. I just couldn’t design anything new, anything happy and cute our brand was known for. I am very lucky and grateful I have such a lovely friends who supported me and BenBen with our deep sorrow, it was even worse because little Calvin James was passed away only little time before this happened. Thank you once again Marlene, Cynthia, Ann-Maree, Maria, Elena and all friends on my babies Facebook. Bean made his last donation before he passed away: he donated a Special Rainbow Sweater for ChaCha >>, the little fighter and super hero. This summer I felt it was time to start designing and manufacturing again and ChaCha was the one I wanted to start from. So as a charity surprise I started to knit her a sweater, by the sweater I wanted tell ChaCha and her amazing human mother Cynthia how much I appreciate them and their work. Cynthia has a dog’s heart if you know what I mean ♥ She does charity and rescue help, she shares positivity and love no matter what. 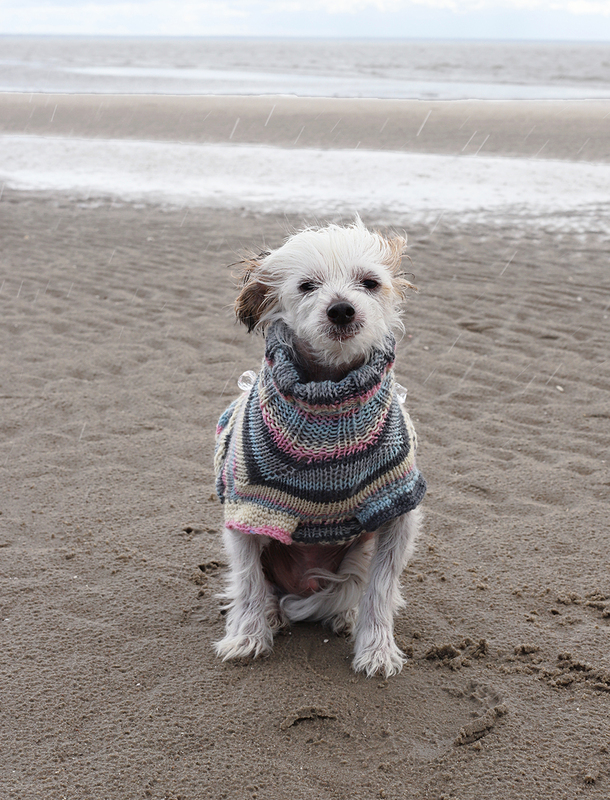 Unfortunately ChaCha unexpectedly passed away before the sweater was done. So many people around the world were crying for this little baby and carried the pain with her family, including me in Finland. It was a shock to everyone. ChaCha’s sister Donatella was just moved to live in their house and she was going to keep ChaCha’s important rescue help and charity work up after her sister passed. I changed the sweater to fit for Donatella and made the design reminds us all about ChaCha. This way sisters could continue their life together no matter we can’t see ChaCha here with us anymore, we can still feel her. The sweater was on its way to Texas to Donatella when I got to know little baby was passed away. Those two close together losses wounded me deeply – I was experienced my own loss very similar way one year ago. All my thoughts were with this family. Now their sister Talloula wears the sweater and we can remember both girls when we look at its pink shades and bright diamonds. 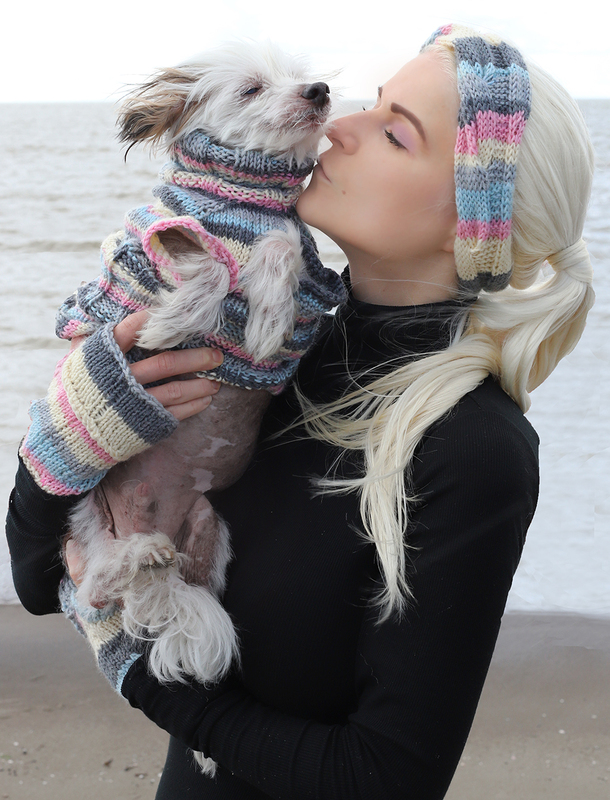 After also Donatella passed I decided to not only keep up donating sweaters but also open own charity dog clothing line for helping rescue dogs. I have got lots of help from Marlene, she has given me impartial help as a friend but also as an experienced rescue mom and helper. God bless this kind of people, we need them more in this world. I have already started to design and manufacture samples of rescue line, when I put this line for sale it means 50% off all sales goes directly to the chosen organization.I will publish the organization up when clothes are available to buy. My heart is bathing in pain when I think about evil of this world. The source of evil is human, our species is the reason for all wars, all torturing, puppy mills, for all anger and envy, for all negativity. Human is responsible for all of this and no matter human knows what is right and what is wrong it doesn’t mean human has to care about it. Because human is selfish, human is powerful, human is an only mammal who can create and build its own environment but also can destroy it by its own action. Where’s the sense in that? I am ashamed of human species, I don’t want to be part of that mass. It only helps I know as long as we are humans we are powerful and we have a possibility to do right and choose better. It is our own choice. What do we do and how do we spend our days. Are we going to be bad or good. Will we close our eyes or will we do our best to stop the cruelty?